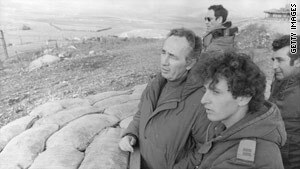 Shimon Peres, pictured left in 1976 during his tenure as Israeli defense minister. (CNN) -- Israel "has never negotiated the exchange of nuclear weapons with South Africa," its president's office said Monday, after a British newspaper claimed such talks had taken place. The Guardian published what it said were previously secret South African documents saying the two countries' defense ministers had discussed the possible Israeli sale of nuclear weapons to the apartheid-era state in 1975. The newspaper said the documents were the first written proof that Israel had nuclear weapons. Israel has always refused either to confirm or deny that. But Monday, President Shimon Peres' office issued a statement saying, "There exists no basis in reality for the claims published this morning by the Guardian that in 1975 Israel negotiated with South Africa the exchange of nuclear weapons. "Unfortunately, The Guardian elected to write its piece based on the selective interpretation of South African documents and not on concrete facts," the statement said. Peres was defense minister at the time of the alleged negotiations, and the Guardian says his signature is on one of the memos. Part of that memo has been blacked out, but a part that is visible mentions "all information, know-how and materials," then has several words blacked out, followed by "schematics, plans and drawings supplied or transmitted... in the course of negotiations or in pursuance of any of the aforesaid agreements." Much of the rest of the visible part of the document is about keeping the agreement secret. It makes reference to an "Annex A," which does not appear in the Guardian article. The document, posted with others on the Guardian's website, is apparently signed by South African Defense Minister PW Botha and dated April 3, 1975. A signature appearing to be Peres' is not dated. The document is stamped "Top Secret" and "Declassified 2006-05-30." Another memo, apparently bearing Peres' signature and published on Israeli Ministry of Defense stationery, thanks South African Information Secretary E.M. Rhoodie for his "great efforts" in ensuring successful meetings between Israel and South Africa in December 1974. The document says a "vitally important cooperation between our two countries has been initiated," but does not go into details. A third document purports to detail talks between Botha and Peres. Botha asks for "the correct payload" and Peres tells him it is "available in three sizes," according to the South African minutes of the meeting. The documents -- all South African -- were obtained by a researcher, Sasha Polakow-Suransky, for a book on the close relationship between the two countries, the Guardian says in its article by Washington correspondent Chris McGreal. The book, "The Unspoken Alliance: Israel's Secret Relationship with Apartheid South Africa," is due to be published Tuesday, according to Amazon.com. Israel said the newspaper did not seek Israeli official comment before publishing the article. Israel has long been assumed to have about 200 nuclear warheads.